When we go on vacation I figure if I'm in a car for 8 hours at a time, I might as well be doing something constructive! What's best way to stay connected? WiFi? Something else? First: if you plan to use your computer while in motion I hope that you're not the one driving. Second: WiFi is a great solution when stopping at rest stops that offer it, or at local coffee shops that have WiFi hotspots along the way. Unfortunately, WiFi is not a general-purpose, connect-anywhere solution; it has a very severe limitation that rules it out for this connectivity as you drive down the road. WiFi is a short-range technology - meant to use in a home or small area, and connects to your WiFi router that is connected to your DSL/Cable/broadband. Most laptops come WiFi ready. If all you want to do is connect at hotspots while you're parked (hotels, McDonald's, Starbucks, what have you) then WiFi works, since that's what the hotspots provide - a WiFi interface to their own broadband connection. There's actually nothing wrong with firing up WiFi in your moving vehicle, the problem is simply that with only 300 feet of range, there's not likely to be anything to connect to. (We'll look at one exception to this at the end of the article.) At best, you might get very brief connectivity to other WiFi hotspots you pass on the road, or the WiFi of others who might happen to have a computer running in their vehicles. 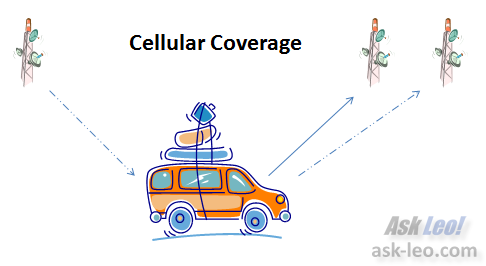 The current best approach to getting connectivity in motion, or without having to rely on WiFi hotspots along the way is to get a cellular modem and a data plan from your cell phone provider. To begin with, the range of cellular signals isn't measured in feet, it's measured in miles. That means that you don't need to be nearly as close to cellular towers as you do WiFi hotspots. Secondly, your cellular provider has established a comprehensive network of cell towers that will provide you continuous and transparent connectivity as you drive along the highway. Before you get out of range of one tower the system "hands you off" to the next tower along the way, without interrupting your connection. All in all, exactly like your cellular phone calls. And this is exactly what I do. I have a USB cellular modem from my cell phone provider that I can plug in to my laptop. Anywhere there's cellular coverage, I get connectivity. And yes, my wife's been known to work for an hour or two while I drive, heading up the highway. I'm very pleased. There are laptops that actually include cellular broadband hardware, so you wouldn't need an additional modem. I tend to shy away from them because just like cell phones themselves, they work with only one provider. If I want to change providers I simply get a new modem, not a new laptop. In addition, since I have several portable machines, my USB modem will actually work in any of them. This device can be considered a portable WiFi hotspot that uses your cellular modem for internet connectivity. In a nutshell, you plug your cellular modem into one side, and the router provides a WiFi hotspot out the other. That hotspot is then available to any WiFi enabled computers in range. Put that in your car, and you've got a moving WiFi hotspot. 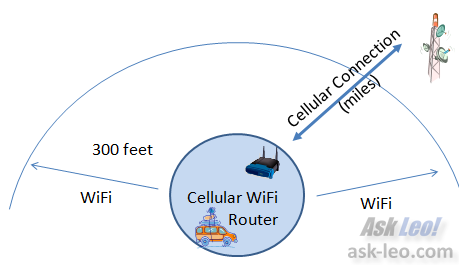 It's a great way to provide connectivity for more than one computer at a time, and for computers that, for whatever reason, can handle WiFi but not the cellular modem directly. How do I get wireless internet? You hear a lot about the wireless internet, but it's not something you can just connect to anywhere. It's more often something you set up. How should I stay connected while traveling? Fortunately for the wired traveler, mobile connectivity has improved dramatically. We'll look at some of the many options you have to choose from. A friend of mine uses Verizon Global Satellite Broadband Internet Access. She is currently in Greece and it works over there. So long as you have a clear view of the southern sky you will get a broadband connection. The device itself is battery powered but comes with a power adapter. Only 11x15" and weighs about 3.2Kg. Google MIFI. This is esentially a combined cellular modem and 5 user wifi router so you can share your connection. (My Cell phone does not use "minutes" when a wifi connection is available.) These are pretty new at least one carrier has a "daily" plan vs monthly. F.Y.I. your carrier does not need to be teh same as your cellular carrier. That is all fine and dandy but since I am not made of money, I would like to know what this rolling connection is going to cost me. That's going to vary a great deal based on the carrier you choose, and the data plan you choose. I've found that pricing is comparable to other internet connections. As I write this I'm paying roughly $50/month for 5GB/month of data transfer. 2) If you have a built-in that would only work with a specific carrier, that would not prevent you from using a USB modem. The above is in reference to your statement "There are laptops that actually include cellular broadband hardware, so you wouldn't need an additional modem. I tend to shy away from them because just like cell phones themselves, they work with only one provider. If I want to change providers I simply get a new modem, not a new laptop. In addition, since I have several portable machines, my USB modem will actually work in any of them." I'm in Canada and several of the cellular providers that I know about (Rogers, Bell, Telus, etc)have "USB sitcks", going by various names. These are complete cellular modems in a "thumb drive" package that don't require an actual cell phone tethered to a modem plugged in to your computer. I believe that's what Leo, and possibly several others, are referring to but, because of the terminology, I can't be sure. Where available, this is a lot less hardware intensive, a lot less hassle and you can still make and receive calls with your cell while online with your laptop. SpacemanBill mentions the ''USB sticks'' easily available in Canada from various providers such as Rogers, Telus, Bell. These are excellent, so easy to use and work very well. I imagine that all major carriers in the US, UK, UE, Japan use the same technology. By the way, Leo's article is excellent. Dumb Question: I have a tablet that is WiFi (no 3G/4G or USB port). Is there such a thing as a portable Wifi device available? Yep. Typically called "MyFi", they're available from cell phone providers. For a monthly fee (of course) they pull internet off the cellular network and make it available as a WiFi hotspot. Some smartphone also have this capability available for an extra charge. You could get a cell phone that projects a Wifi spot, and then use the tablet off of that. So, yes, there is portable Wifi devices. I know that Verizon has them, probably other carriers too. You can even run a computer off a cellphone wifi. I'm going to look into this this week. From what I've read this seems like it is a bit expensive. I'm going to call Verizon and see if I can have my cell enabled to do this.